The Israeli Chamber Orchestra will break with tradition to play a work by Hitler's favourite composer, Richard Wagner, in Germany. 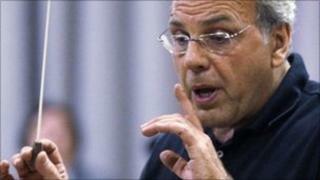 Roberto Paternostro will conduct classical piece Siegfried Idyll on Tuesday at Bayreuth's Wagner festival. It is rare for Israeli musicians to play the anti-Semitic composer's work, which was appropriated by the Nazis. Paternostro said that while Wagner's ideology was "terrible", the aim was "to divide the man from his art". An unofficial ban on Wagner was introduced in 1938 by the Palestine Orchestra - now the Israel Philharmonic - after Jews were attacked by the Nazis in Germany. Musical director Paternostro said it had been "a very difficult and rocky path" but that "there wasn't a moment when I had any doubts about this project". "I know that in Israel this isn't accepted," added Paternostro, who is Jewish and whose mother survived the holocaust. "But many people have told me it's time we confront Wagner, especially those in the younger generation." It was too soon for the orchestra to perform Wagner in Israel and they had not rehearsed the work there, he added. Hitler was a passionate admirer of the work of Wagner - who lived from 1813 to 1883 - as well as his theories on Germanic racial purity. The Israeli Chamber Orchestra's performance forms part of a fringe festival linked to Bayreuth's annual Wagner opera festival which begins on Monday with a production of Tannhauser. In July 2001, conductor Daniel Barenboim led a German orchestra in performing a piece from Wagner's opera Tristan und Isolde, at the annual Israel Festival. At the end of a concert in Jerusalem, Israeli Barenboim told the audience the orchestra would be playing the piece and that anyone who objected could leave. Some angrily protested and left the hall but at the end of the performance, the audience gave it a standing ovation. In December, pianist Barenboim told reporters: "We need one day to liberate Wagner of all this weight."